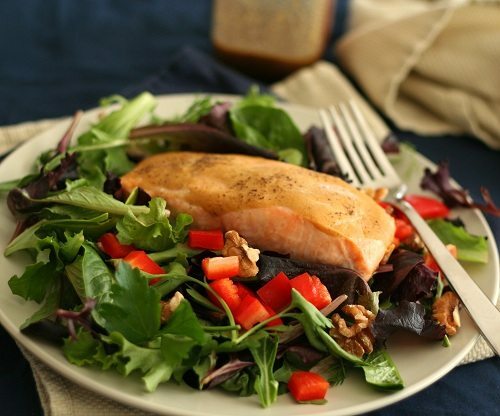 A heart healthy salad, full of Omega 3s and satisfying enough to be the full dinner. For Walnut Oil Vinaigrette, whisk all ingredients together and set aside. For the salad, preheat oven to 425F and brush a large glass or ceramic baking dish with olive oil. In a small bowl, whisk together Dijon mustard, maple syrup and maple extract. Cut filet into 4 even portions and arrange in baking dish. Sprinkle with salt and pepper and brush with glaze. Bake 9 to 11 minutes, until fish is cooked through and flakes easily with a fork. Remove and let cool 10 minutes. Divide salad greens between 4 large plates. Sprinkle each with chopped red peppers and walnuts. Top each with a salmon portion. Serves 4. Each serving has 11 g total carbs and 5 g of fiber. Total NET CARBS = 6g (If using sugar-free maple syrup). Members visited fitness facilities an average of 102.5 times in 2011. How Many Pull-ups Does It Take To Make A Female Marine?